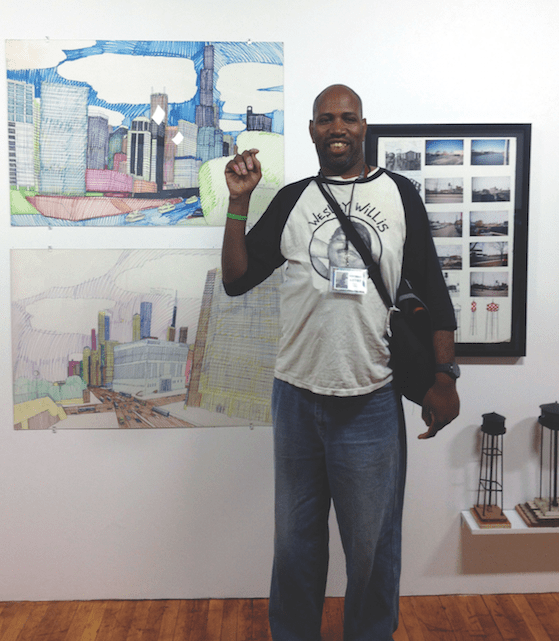 Project Onward is “finally completely independent” from the City of Chicago’s cultural programming office, says Rob Lentz, executive director of the gallery and studio that supports adult artists with mental and developmental disabilities. Project Onward “deserves to have its own identity,” he says, after being housed on the first floor of the Chicago Cultural Center since 2004, and fully funded by a variety of city affiliates over those nine years. Visitors to the first-floor studios and gallery at the Cultural Center could wander in and watch the artists at work in their open studios, get a portrait drawn by a resident artist, or buy some of their work in the shop. And they did, in droves. At the Cultural Center, “we had lots of foot traffic,” says Lentz; “tens and tens and tens of thousands” of visitors. Any artist would love that kind of exposure, but if it seemed like Project Onward were a zoo exhibit, then “the visitors were the animals,” says Lentz. With new mayoral leadership in Chicago came a restructuring of the city’s culture office. And its priorities changed. The Department of Cultural Affairs (DCA) as envisioned by Richard and Maggie Daley and Lois Weisberg was a “golden age,” says Lentz. “The city co-existed with not-for-profits” like Project Onward. “There was fluidity and nimbleness,” says Lentz. Now the DCA is DCASE, or the Department of Cultural Affairs and Special Events. Under the new commissioner, Michelle Boone, “DCASE was prepared to fully integrate the program back under our Department’s operations,” says Jamey Lundblad, DCASE’s communications officer. Lentz says there were “layers of bureaucracy” that would have made Project Onward a nightmare to continue to run from within the Cultural Center. This summer, Project Onward relocated to the city’s art frontier: Bridgeport. Large, cheap studio spaces attracted Lentz and his staff to the fifth floor of the Bridgeport Art Center, which currently houses dozens of artist studios and a gallery. All forty of Project Onward’s artists made the move. Lentz says he may miss all the free and great visibility afforded by the Cultural Center, but “our most dedicated fans will go anywhere.” In Bridgeport, the artists can be more productive, and with less distractions. The new space, formerly offsite storage for the Joffrey Ballet, is thirteen thousand square-feet, a major increase from the four thousand at the old Cultural Center space. 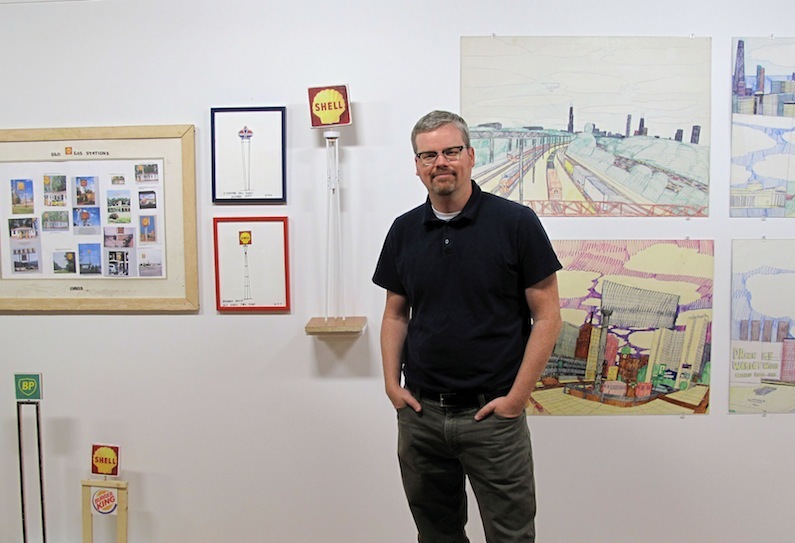 “We were addicted to the Cultural Center,” says Lentz, but “we couldn’t grow.” Now, in their new space at the Bridgeport Art Center, Project Onward can increase the range of media it offers artists, including printmaking and ceramics. Whereas the Cultural Center limited the hours of access for Project Onward, now they can hold evening events and film screenings. Few onlookers may realize that Project Onward is a highly competitive resource for artists. It’s not a day program or babysitting or art therapy. Project Onward provides what so many artists desire: professional development, mentoring and a free studio space. Though they do not teach classes, Project Onward facilitates sales, and takes a forty-percent commission. “Joy Bus Ride: Wesley Willis and Ricky Willis” shows through November 2 at Project Onward, in the Bridgeport Art Center, 1200 West 35th, floor 5.